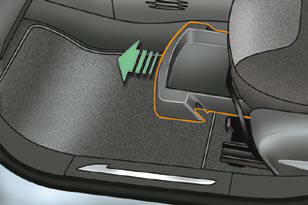 The storage drawer is located under the front passenger's seat. Raise the front of the drawer and pull it. Bring the drawer to the end of its travel. Press the ends of the slides. Raise the drawer and pull it fully. Engage the drawer in its slides. At the end of its travel, press on the top of the drawer to secure it. Do not place heavy objects in the drawer.